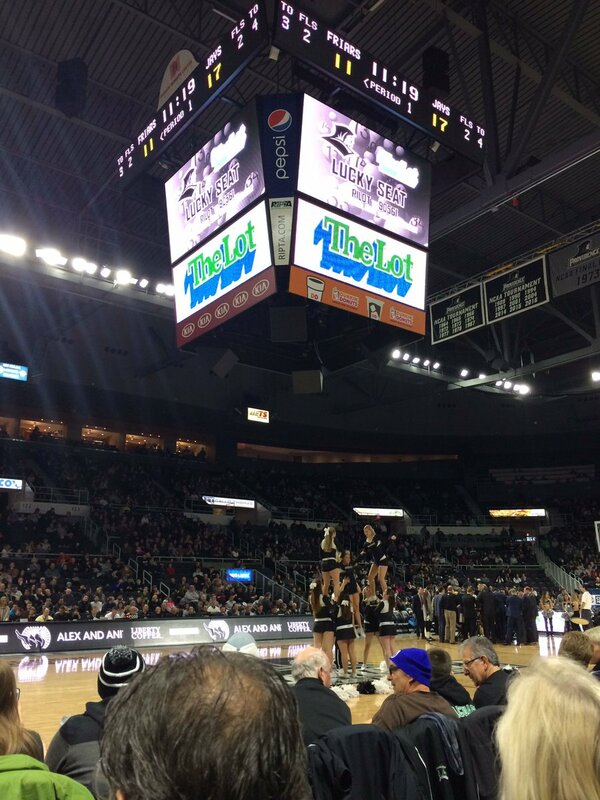 The number 10 ranked Creighton Bluejays traveled to Providence in the midst of a snowstorm and came out with a win over the Friars at the Dunkin’ Donuts Center. This was the first game of the year that I was able to attend in person and of course it just happened to be the one with the worst weather. Creighton’s three bug guns, Maurice Watson Jr., Marcus Foster, and Justin Patton were as good as advertised and once Kyron Cartwright went down with a knee injury for the Friars, their margin for error in the upset attempt of the Bluejays was far too thin for the Friars and ultimately resulted in a 14-point loss. Emmitt Holt carried the Friars on the offensive end (17 points) with a very impressive array of drives and post moves against Patton, a projected 1st round pick in this year’s coming NBA Draft. 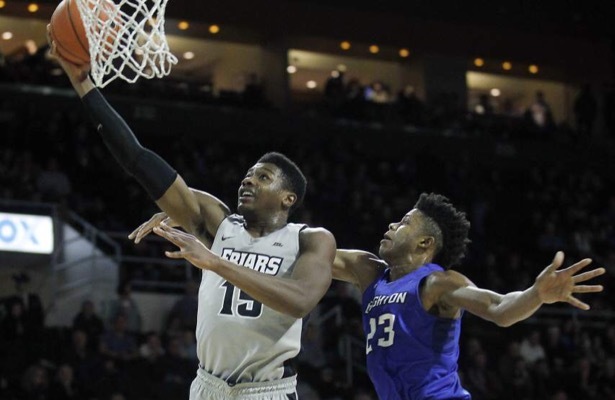 All three freshmen (Kalif Young, Alpha Diallo, and Maliek White) took some growing steps in the game but the Friars need to be at full strength in order to beat a team of Creighton’s caliber. This was Creighton coach Doug McDermott’s first win at PC and he is now 2-6 all-time against the Friars. This was the best game that I’ve seen out of Emmitt Holt this season. He really picked things up once Cartwright was benched with knee tendinitis. Holt finished with a team-high 17 points on 7-14 shooting and 7 rebounds. Holt vs. Patton reminded me a lot of when Ryan Gomes played against Emeka Okafor at UConn the year that UConn won the National Championship. Holt, much like Gomes, made up for his lack of size against a top prospect by fundamentalling the guy into the ground, finishing with both hands and attacking him straight into his body to mitigate his ability to block your shot. I was impressed with Holt. Which gives me a reason to post one of my all-time favorite clips from Jim Calhoun. Maliek White played the most minutes in any game he has appeared in this year with Cartwright sidelined for the entire 2nd half. White logged 27 minutes of playing time and looked pretty comfortable running the offense with those extended minutes. You’re obviously not going to get either the points or assists totals that Cartwright would provide but he did a serviceable job in reserve. White finished with 4 points, 5 rebounds, 2 assists, and 2 steals. He also coughed up 2 turnovers to go with those 2 assists. Minutes like this against a top tier opposing point guard like Maurice Watson Jr., should pay some dividends for White long term. Kalif Young led the Friars with 9 rebounds. He also chipped in 9 points, coming a point and board shy of his first double-double. He did all this in just 13 minutes. Those are some impressive and impactful numbers in such a short amount of time. if you don’t put a body on Kalif at all times, he’s going to make you pay with hustle. I feel like I may have said this before, but Alpha Diallo is going to be freaking good. Diallo had 8 points and 5 rebounds and just looked like he belonged out there against Creighton. His size is going to be hard to deal with and he already looks like he’s caught up to the speed of the college game. The one thing I think he needs to pull back on is the triumphant standing and mean mugging after every bucket. Yeah, when you get an And-1 or a slam or something I’m for it, but he needs to get back on D quicker after buckets like the above one…just sayin’. Bullock struggled mightily from the floor once again, going 3-13 for just 6 points. He can’t do that against the top half of the Big East and have PC win the game, he just can’t. Jalen Lindsey finished with 11 points but shot just 4-12 from the floor. He did however go 2-5 from three. Lindsey appeared to hurt his hand or wrist near the end of the game as he could be seen holding it before coming out late in the second half. Isaiah Jackson scored the ball well with some midrange jumpers that have you saying no, no, no before exhaling with a yes after it goes in. However, he was very sloppy with his passes, contributing 4 of the Friars 11 turnovers as a team. Jackson also seemed a step slow on defense, losing his assignment at times and letting Marcus Foster get some easy hoops. Ryan Fazekas played 7 minutes and did not record a single field goal attempt…ugh. Justin Patton is the real deal. He reminds me of Marcus Camby with his length, athleticism and ability to hit shots from distance. His shot is extremely smooth for a big guy. To be fair, the Friars don’t really have a big guy at Center that can match up with him defensively. Patton’s defense can definitely improve as he gets to the next level. He redshirted last year to improve his overall game and put on some muscle which was a smart move on his part but his positioning on defense around the hoop puts him in spots where he can’t defend at the rim sometimes. He’ll obviously get a block here and there just based on his wingspan and height but he lost track of Holt on more than one occasion that led to easy hoops. Apparently both him and point guard Maurice Watson Jr. were dealing with the flu so that could be a factor but I haven’t seen any other full game of Creighton so I’m just going off this matchup. Just an FYI, he would look great in Celtic green. Mo Watson sure didn’t look like he was sick though as he recorded a career-high 14 assists. Once Cartwright went out of the game, there was no one on PC who could stay in front of Watson whatsoever. Once he took his first step, he was already by his defender. It looked like everyone else was in slow motion. There’s a reason Watson leads the country in assists per game. What I didn’t expect as much was his ability to finish over bigger players at the rim. They had an Isaiah Thomas feel to it. The Celtics Isaiah not the Pistons one. I think that Creighton is a legit Final Four threat. They’ve already beaten Wisconsin, Nebraska, NC State, & Seton Hall, this year and have the offense to score with anyone in the country. They also have a Big Three with Watson, Patton, and Foster and all three of them have completely different set of skills (for some reason I say set of skills in a Liam Neeson voice). They’re going to be a tough out come March. I like Doug McDermott. That’s neither her nor there, but just something I wanted to say. Shouldn’t Bluejays be two words? Am I crazy or just a terrible speller? A pic from the game. Next Up, PC takes on DePaul at DePaul at 9 PM on FS1.